You might think of an espresso shot as a fairly simple things, one hit of coffee with a small amount of water - a quick, fast, hit of caffeine. However, if this is all you think of when you hear the word espresso then you've obviously never explored the many styles of coffee that all start with a simple espresso. 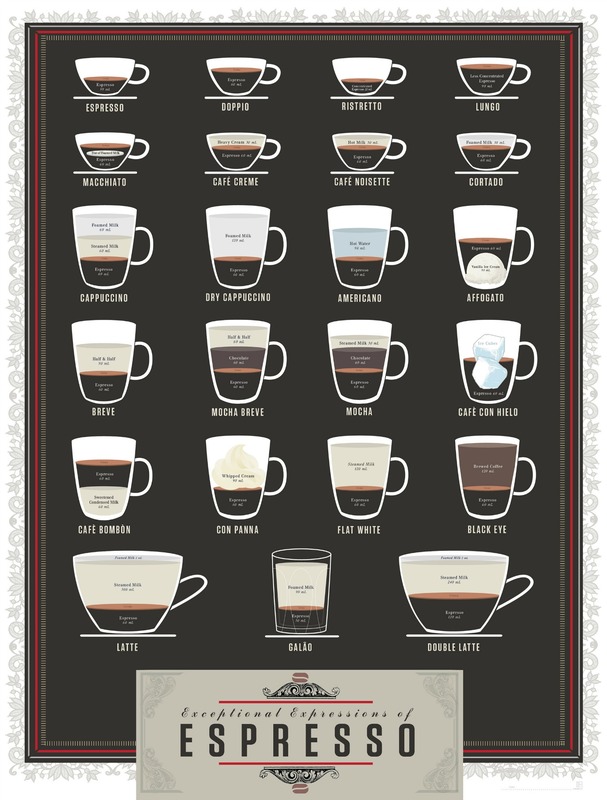 In this poster from Orbit Visual Graphic Design and the Pop Chart Lab, the Exceptional Expressions of Espresso, all 23 different styles of coffee are laid out and explained: here is the list, what's your favourite? Espresso, doppio, ristretto, lungo, macchiato, café creme, café noisette, cortado, cappuccino, dry cappuccino, americano, affogato, breve, mocha breve, mocha, café con hielo, café bombon, con panna, flat white, black eye, latte, galao, double latte. Amazing post, These are the best coffe types I ever seen, Now I want to try some of them.